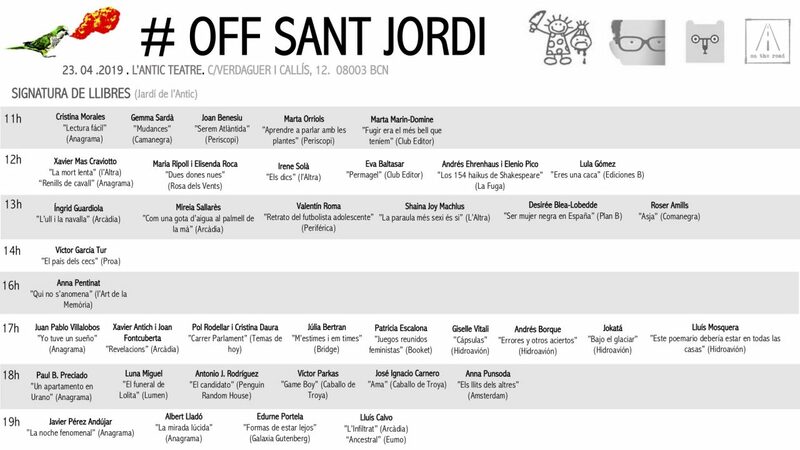 In order to celebrate Antic Teatre’s 16th anniversary and OFF Sant Jordi ’19 we’ve programmed an entire day of activities and events for all the family. 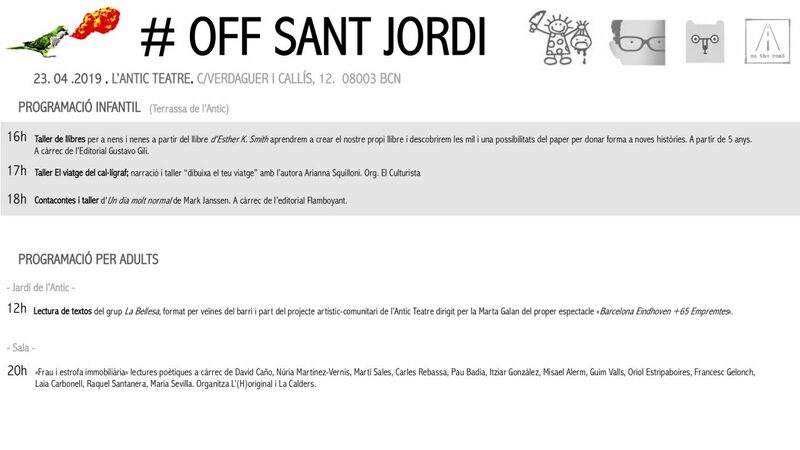 On April 23rd we’ll be celebrating Antic Teatre’s anniversary together with Sant Jordi for the fifth year running. There will be bookstalls, children’s workshops, book signings and readings on the terrace, in the garden, and in the auditorium. All activities are free except for the evening performance (which is pay as you feel). – Cast members of La Bellesa will read texts from their upcoming show Barcelona Eindhoven +65 Empremtes, at 12 noon in the garden. – Children’s workshops (organised by El Culturista): from 4pm to 7pm, two workshops where children can learn to make their own book (with publishers Gustavo Gilli) and draw their own journeys (with autor Arianna Squilloni), plus a storyteller (provided by publishers Flamboyant). – Showing in the theatre at 8pm, Frau i estrofa immobiliària (organised by L’(H)original). Synopsis: “Of the many existing ways of bursting the housing bubble, we at L’(H)original believe in using the dissident voice of poetry to express urban discontent and defend the street as something counter to the bureaucratic nightmare known as ‘public space’. Poets reading are: David Caño, Núria Martínez-Vernis, Martí Sales, Carles Rebassa, Pau Badia (nomdenoia), Itziar González, Misael Alerm, Guim Valls, Oriol Estripaboires, Francesc Gelonch, Laia Carbonell, Raquel Santanera, Maria Sevilla, Patricia Heras.